← What does psychology have to offer at end of life? We continue our series on the posters that caught our attention at the 9th World Congress of the EAPC Research Network in Dublin last year. Conference posters are an important feature of every European Association for Palliative Care Congress – presenting the key messages of a project in a creative, informative and eye-catching way. This series also offers an opportunity for discussion of these interesting and challenging posters, and makes them visible beyond the (sometimes rather small) range of readers in front of the poster billboards. Maybe this is an interesting new approach to scientific presentations using social media. Mariona Guerrero, Josep Porta-Sales and Rebecca Latter from the WeCare Chair: End of Life Care research group, Barcelona, Spain, explain the background to the group’s poster. The WeCare Chair: End of Life Care was founded in 2013 as a way of consolidating the research of experts from the Universitat Internacional de Catalunya. Its aim is to examine and address the needs of palliative care patients and their families. Later that same year, the 1st International WeCare Workshop entitled “The wish to hasten death: a clinical vision of a new-old syndrome?” was held to celebrate the formation of the WeCare Chair: End of Life Care at Universitat Internacional de Catalunya. 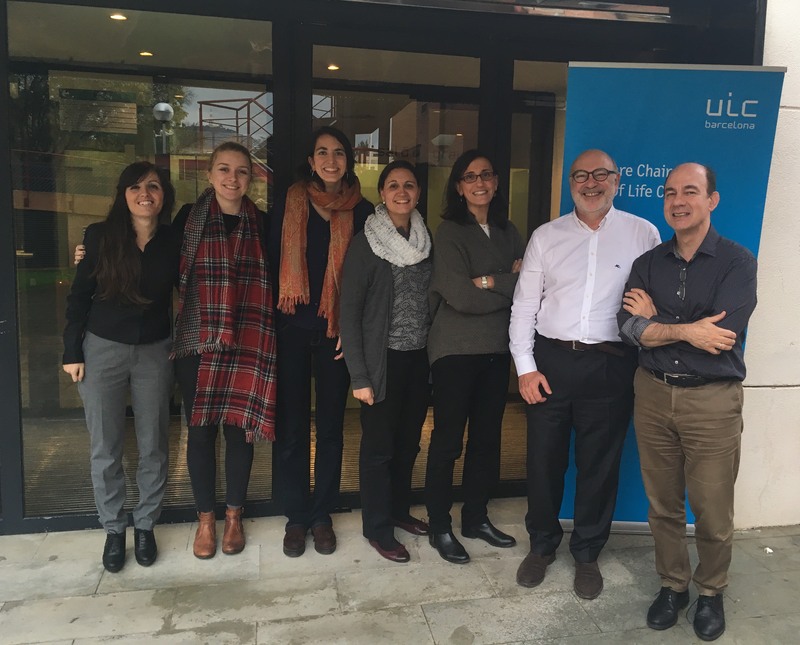 In the context of this workshop, a research meeting was organised, with researchers from the field of palliative care from four countries: Belgium, Germany, Norway and Spain. Despite the workshop itself being a success, the meeting was at times controversial as researchers from across Europe clashed when discussing certain aspects of the subject at hand: the wish to hasten death (WTHD). However, it soon became clear that this inability to agree with one another was down to a fundamental communicative issue: a lack of clear-cut definitions in the field. After discussions in the meeting, an agreement was made to carry out a Delphi consensus process in order to reach a consensus on the definition of the construct of the WTHD. It was agreed to invite renowned researchers and clinicians from the field of palliative care who were experts in the wish to hasten death. 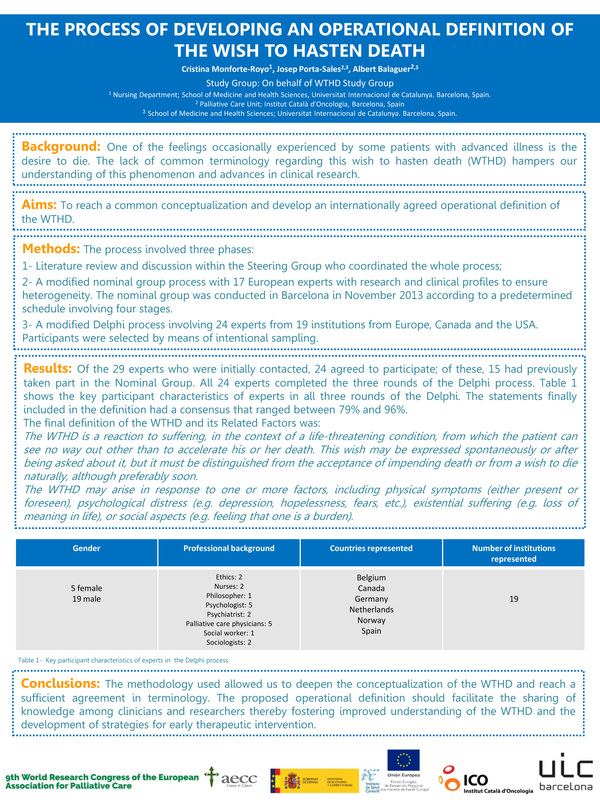 After one year working on the Delphi consensus, in November 2014, the 2nd International WeCare workshop took place under the title “What do we say when a patient says: I don’t want to live like this anymore?” The research meeting, which involved 20 experts from Belgium, Germany, Norway, Spain and United States, aimed to present the results of the first rounds of the Delphi process while exploring research related to the WTHD in patients with advanced disease. View a video clip of the meeting here (with English sub-titles). “The Wish to Hasten Death (WTHD) is a reaction to suffering, in the context of a life-threatening condition, from which the patient can see no way out other than to accelerate his or her death. This wish may be expressed spontaneously or after being asked about it, but it must be distinguished from the acceptance of impending death or from a wish to die naturally, although preferably soon. As published in the subsequent article in Plos One (click here to see the full article). The WTHD is a phenomenon that both results from and causes suffering in patients with advanced illness. What’s more, it often entails suffering in the patients’ loved ones. The WTHD is a complex phenomenon, the study of which is hampered by a lack of appropriate vocabulary. In this sense, having a clear definition of WTHD facilitates communication between medical professionals and facilitates advances in research about this phenomenon. To see other publications and research by the WeCare Chair, please visit this link. If you are interested in other activities including courses and training days led by WeCare, please visit our website. ‘The process of developing an operational definition of the wish to hasten death’ by Cristina Monforte-Royo, Josep Porta-Sales and Albert Balaguer on behalf of WTHD ad Hoc Research Group. (Abstract number: P20). View the abstract for this poster in ‘Abstracts of the 9th World Research Congress of the European Association for Palliative Care (EAPC), Dublin, Ireland, 9-11 June 2016’ published online on the Palliative Medicine website. Is palliative care possible in prison? A national PARME study about inmates with terminal illness in France. This entry was posted in EAPC World Congresses, EAPC World Research Congresses and tagged Definition of the wish to hasten death. Bookmark the permalink.